We’re into Evil Dead in a big way. 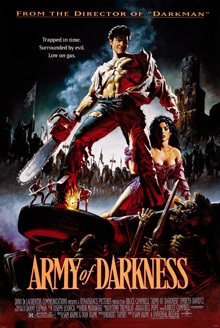 Here, the third film in the trilogy, Army of Darkness, starring The Chin himself, (screw you, Quagmire and Bob Hope) Bruce Campbell. Ash is transported (along with his iconic jalopy Oldsmobile) to the 14th century, and instead of finding the Black Plague, he comes across an impossibly sunny landscape of Anglia (which resembles southern California, where this was filmed). He has to find THE BOOK, in order to get back to modernity. That tome is Necronomicon, and an incantation must be uttered to get back home (naturally, Ash screws this up, and is doomed to hanging around the Middle Ages for a bit longer than intended, battling undead hordes). The film was nearly called Medieval Dead, or Medi-evil Dead, but this Dino De Laurentiis production went through a slew of changes, many of which were vehemently opposed by Mr. Campbell. So, how does it hold up? If it were made independently of The Evil Dead, would it be more heralded? 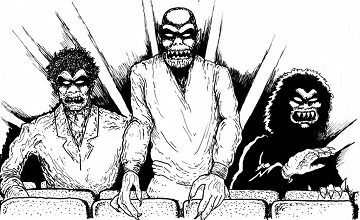 On this episode of the Really Awful Movies Podcast, a discussion of the tone of the film, Deadites, the production process, viewing films through the lens of nostalgia, and much much more. Looking forward to a smashing episode 200!